NAMIBIA is a sun-baked land of geographical extremes wedged between the Kalahari and the chilly South Atlantic. Namibia is rich in resources and spectacular natural beauty with a solid modern infrastructure and a diversity of cultures. Namibia has a harsh climate but still boasts some of the world’s grandest national parks. They are the world-famous wildlife-oriented Etosha National Park, the huge Namib-Naukluft Park, as well as the Caprivi region, the Fish River Canyon and the Skeleton Coast parks. The forests and waterways of the northeast gradually change to acacia shrubs and trees as one moves towards the center of the country. The northwestern area of Kaokaveld and Damaraland is a semi-desert region, extremely rugged with high mountains dropping down into deep valleys. The west coast consists of the Namib Desert and the notorious “Skeleton Coast”. This is also the area in which one finds what is reputably referred to as the world’s highest sand dunes. The Namib Desert on the west coast, at 80 million years old, is the oldest and most picturesque desert on earth. As well as boasting the highest sand dunes in the world, over 1,250 feet high, the Namib is spectacularly diverse with scenery ranging from the mountains of Damaraland in the north through the Skeleton Coast in the west, to the giant red dunes of Sossusvlei in the south. As one moves south through the interior of the country it becomes more arid and flat. The country has only a few perennial rivers. To the north and east are the Zambezi, Kwando, Okavango and Kunene Rivers and in the south the Orange River. These rivers act as natural boundaries to the neighboring countries. ETOSHA NATIONAL PARK – The vast park protects 114 mammal species as well as 340 bird species and 16 reptiles and amphibians. Etosha National Park, known as the ‘Great White Place of Dry Water’, surrounds its namesake the vast white and greenish-colored Etosha Pan. Etosha National Park is ‘the’ place to see incredible varieties of African animals in one of the world’s greatest wildlife-viewing areas. 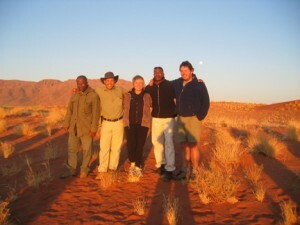 NAMIB-NAUKLUFT PARK – The park is made of 23,000 sq km of desert and semi-desert. The park consists of the Namib Desert Park, the Naukluft, the dune fields around Sossusvlei and the bird lagoon at Sandwich Harbor. Sesriem is the gateway to Sossusvlei, a large ephemeral pan,set amid red sand dunes which tower up to 200m above the valley floor. 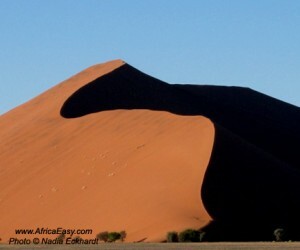 Many say that Sossusvlei contains the world’s highest, oldest and most picturesque dunes. Dead Vlei is a 5km roundtrip-walk from Sossusvlei, a really impressive sight. DAMARALAND – Named after the people of Damaraland, this territory lies between the Skeleton Coast and Namibia’s Central Plateau. Damaraland has wide open spaces and is home to many desert-adapted species, including giraffe, zebra, lion, elephant and rhino. THE SKELETON COAST – The term ‘Skeleton Coast’ refers to the coastal stretch between the mouths of the Swakop and the Kunene Rivers. The Skeleton Coast Park, further north, takes in nearly two million hectares of gravel plains and sand dunes to form one of the world’s most ‘inhospitable’ waterless areas. The name is derived from the treacherous nature of the coast – a foggy area with lots of rocks, sandy coastal shallows and a number of shipwrecks. WINDHOEK – Windhoek, translated is ‘windy corner’ and is set in the geographical heart of Namibia serving as the countries commercial nerve center. Windhoek is the capital of Namibia at an elevation of 1660m and surrounded by low hills. Windhoek’s airport is international and most safaris start from here. SWAKOPMUND – Namibia’s most popular holiday destination boasts palm-lined streets, seaside promenades and fine accommodations. Swakopmund is often described as more German than Germany and is the perfect place to spend some time between wildlife safaris. THE HIMBA – Descended from a group of Herero herders who were displaced by Nama warriors in the 19th century. Today, the distinctive Himba or Ovahimba maintain their beautiful traditional dress of multi-layered goat-leather miniskirts. They are adorned with jewelry of ochre, mud encrusted iron, leather and shell jewelry. Their body is covered with a mixture of butter, ash and ochre, which is said to keep them youthful-looking, and they do have beautiful skins! Just like the rest of Southern Africa the earliest inhabitants in Namibia were the San, nomadic people. San communities competed against the Khoikhoi, ancestors of the modern Nama, for territory, water and hunting grounds. The descendants of these Khoisan. San and Khoikhoi people, still live in Namibia today but few have retained their traditional lifestyles. Namibia gained independence in 1990 from South Africa, under the presidency of SWAPO leader, Sam Nujoma, who served 3 terms. Today the Namibian economy remains fairly stable. CLIMATE – Summer October to March/April: between approx. 26 C and a very hot 40 C, cool at night. Winter April to September: minus 2 – 18 C. Cold in the early mornings and evenings. Rainy Season is in Summer which is late November to early April. SIZE – Namibia is 825,000 sq km, and is a predominantly arid country. Namibia can be divided into four main topographical regions: the Namib Desert and coastal plains in the west, the eastward-sloping Central Plateau, the Kalahari and the densely wooded bushveld of the Okavango and Capri regions. POPULATION – Namibia has a population of approx. 1,85 million people which represents one of Africa’s lowest population densities. There are 11 major tribal groups. About 75% of the population, inhabit rural areas. Windhoek’s population is approx. 240 000. LANGUAGE – The official language after independence was designated as English. However, the first language of most Namibians is either a Bantu language or a Khoisan language and San dialects. Afrikaans and German are also widely spoken. CURRENCY – The Namibian dollar (N$) is pegged to the South African Rand.